For the past several years, no trip to New York has been complete without one quiet modest dinner or simply a glass of wine in the shadow of the Williamsburg bridge at Diner. Also a fan of owners Mark Firth & Andrew Tarlow's [now closed] Mexican loveletter Bonita, I had yet to try Diner's next door neighbor, and other sibling Marlow & Sons. 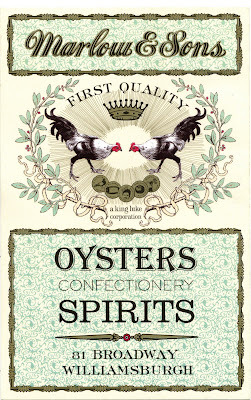 I've heard about the quaint storefront for years, where an old college friend worked for a time, known for their oysters, "confectionery, spirits"...and their oysters. I'll get this out of the way now, in my developing palate for all things sea-grown --Yes, I'm still finding my sea legs.. or sea tongue?-- I have always been too tuna (get it? chicken of the sea?) to try a raw oyster. Yep! Never had one. I've worked at several Northwest restaurants known for their excellent oysters, and passed up the opportunity. For shame! The top of the Marlow menu touts $2.75 East Coast oysters. I had a secret goal for the week. 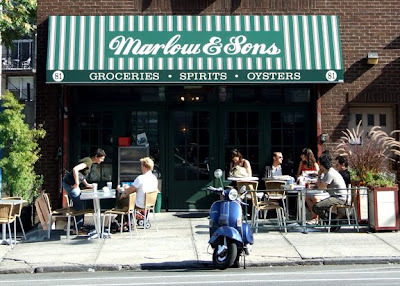 Yes, that means that Marlow & Sons was not to be a one time stop. My hosts frequent the storefront daily as their neighborhood coffee shop and bakery, other assorted sundries (including Portland's Stumptown coffee) available in the front part of the shop, the back room a dim speakeasy-looking dining room and bar. Battling my exhaustion after flying in day one, Mikey took me down the street for coffee, a bite, and eventually a beer on Marlow's sidewalk patio. After our espressos we sampled a couple of executive chef Sean Rembold's appetizers. The Crostini with cranberry beans, escarole, and shaved aged goat cheese was salty, rich and satisfying. The deep-fried corn on the cob with spicy lime aioli and cilantro on the other hand left something to be desired; the frying had dried out the kernels a bit. I found myself enjoying the aioli more than the cobbs themselves.. I moved on to the Parmesan broth with mustard greens, onions, croutons, which hit the spot for a breezy afternoon snack. The cartoon-canned Porkslap pale ale was a nice match, a flavorful amber tinted ale with some edge. The day following the rooftop extravaganza, we slowly met for a casual hangover brunch in Greenpoint and a stroll to the Brooklyn waterfront park where we lounged in the grass all afternoon. As the sun set behind dusky clouds, said college friend (and Marlow alum) suggested oysters to start us off into the evening right. 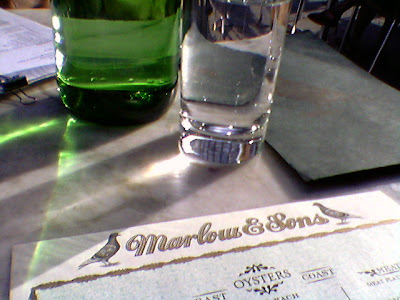 We congregated outside Marlow & Sons just as the dinner rush began. We filed into the back and crammed ourselves alongside the bar for a beer while we waited. I was very pleased with my pint of Pennichuck Feuerwehrmann Schwarzbier, a "black lager"; light bodied dark beer with a clean, crisp, refreshing finish. Luckily a long wooden table opened up for us relatively quickly and we slid into our cozy spot. We left full and happy, taking a long walk in the brisk night, eventually picking up some Belgian beer to return home with and visit late into the night.